Bienvenidos/Welcome to paradise. We are glad you have arrived. The rains are slowing. The sun is shining, and the jungle is alive…so let the fun begin. Our pages are full of awesome restaurants of every flavor. Arbol, Victoria’s, and Z Gastro Bar just to mention a few. Want to catch all the games, try Sancho’s or Jolly Roger for all the action. We have Tour companies to take your adventure to the next level: Titi Canopy for zip lining, learn to surf with Dante’s Water Sports, whale watching and snorkeling with Sunset Sails, and much, much more. Transportation companies (Monkey Ride and the Marina Pez Vela shuttle) that will get you where you need to go. Not to mention great articles to enjoy while chillin’ at the beach or by the pool. The fish are jumping and so will Marina Pez Vela this month. Movie night under the stars is back on Friday nights check out the movie schedule on page 55.The annual Bright Lights Boat parade will be held December at two locations this year. Bracelets for admission will be required so don’t forget to pick up yours beforehand. What a great way to kick off the holiday season for the entire family. Quepos will bring in the New Year with live performances at the sea wall and fireworks from Marina Pez Vela will light up the skies overhead. Make reservations at Mira Olas for great food and views of all the action. Great time to feel all the “Pura Vida” this country has to offer. Our shops are great for your holiday shopping. Check out Mot Mot Gallery, The Captain’s Booty, or Modern Primitive Living for that one of kind gift idea. Also let’s not forget the Toys for Tots boxes in the area and help brighten someone’s holiday. We would like to welcome our new advertisers this month Dante’s Water Sports, Modern Primitive Living, and Nancy Buchan, Violinist. We hope you enjoy our magazine and it helps guide you through this enchanting paradise we call home. You can always follow and share us here or on Facebook/Quepolandia. We appreciate and welcome your comments. 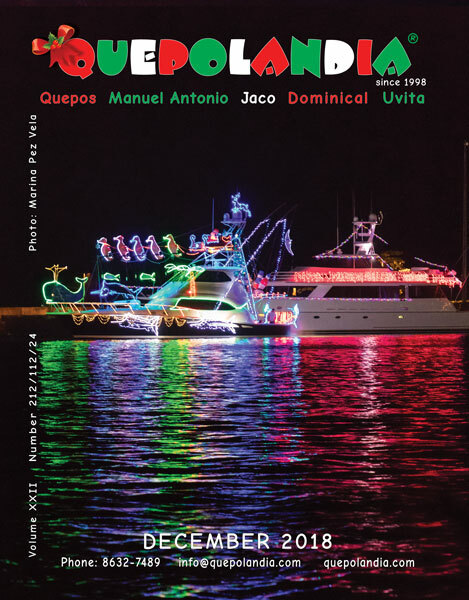 We at Quepolandia would like to wish all our advertisers, writers, staff, and readers a Wonderful Holiday Season and an Incredible 2019!! !